Let me congratulate you for doing so much of service to Tamil film industry in various administrative capacities? Thank you. What we did is very less. There is a lot more to do and we make sure that all our objectives are accomplished for the good of Tamil film industry. You are considered as a mass hero and you surprised everybody by picking up an urbane subject like Detective (Thupparivaalan in Tamil)? I accepted it the moment this script came to me. It’s a script that you will never miss. I just followed Mysskin blindly. It’s an over-intelligent and an eccentric role. There is an inspiration of Sherlock Holmes. Detective is doing well at box office. What do you feel about it? We expect B and C centers to respond well to my mass films. Detective is catering to A centers and multiplexes. Detective has helped me to reach out to new section of audiences. I think Detective 2 to be much bigger in terms of revenues. What is your favorite detective film/series? My favorite detective film is Sherlock Holmes played by Robert Downey Jr. When was the Tamil version released? Why is there a gap of 4 weeks between Telugu and Tamil versions? Initially we had censor delay for Telugu version. Once we had censor cleared, we didn't get theaters in past couple of fridays. Detective, Adhirindi and Gruham - all these Tamil based recent films are facing censor problems for Telugu. What is the reason for the delay? Earlier, they used to censor both versions in Chennai. Now Tamil version is being censored in Chennai and they are sending Telugu version to Mumbai. It’s getting stuck over there which results in delay of release of Telugu version. The short span for theatrical run is opening new challenges for producers. The Tamil version of the film is made available on Amazon Prime Videos even before the release of Telugu version? To be honest, most of the theatrical revenue is generated in first few days of the release. The availability of Tamil version on digital platform didn’t impact theatrical revenue of Telugu version. 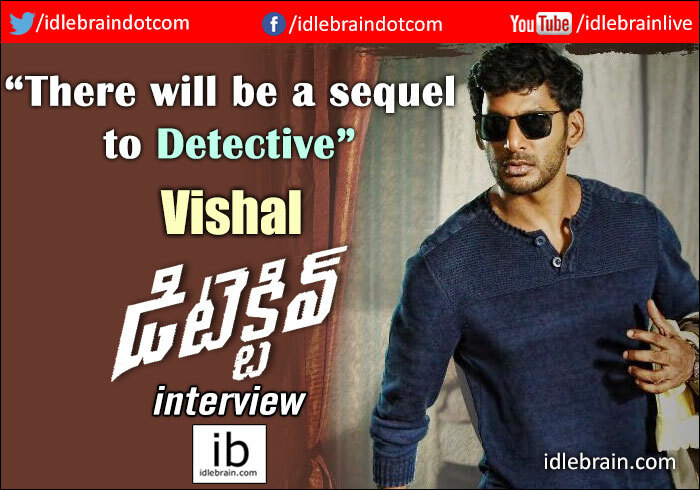 Detective film has opened to good response in Telugu. Don’t you think a bilingual or dubbed version of Tamil in Telugu should be released on the same day to maximise revenues? In overseas, it impacts a lot if not released simultaneously. It’s dangerous to have Tamil version on Amazon Prime even before release of Telugu version? I do agree. But censoring is beyond our control. We need to sort it out and make sure that both versions of a bilingual are released simultaneously. We are planning to make a joint representation and approach Mumbai censor board office. It’s Irumbu Thirai in Tamil and Abhimanyudu in Telugu. Samantha plays female lead. Arjun plays villain. This film deals with digital financial frauds. This film addresses lot of issues faced by common man. It also explores the aspects of data mining when we leave personal information on social platform like facebook. Abhimanyudu’s first look will be released on 17 November. Movie will be released simultaneously in Telugu and Tamil on 12 January. I am doing a sequel to Pandem Kodi, which came in 2005. Story of Pandem Kodi 2 starts where story of Pandem Kodi ends. We are also going to make a sequel to Detective film.